I walk into the Hive, Bumble’s Beverly Hills pop-up space, and I’m immediately handed a canary yellow rose. “It’ll be about 40 minutes,” the handsome male receptionist tells me. 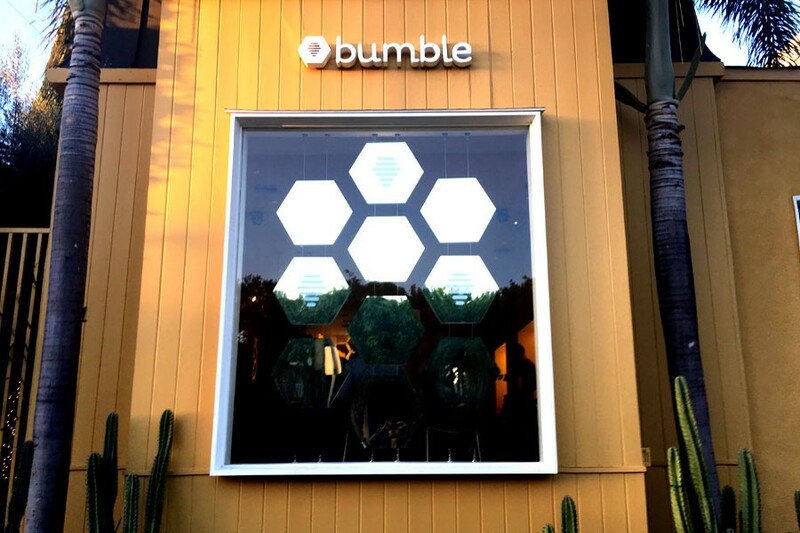 Like everything in the space, his outfit — a denim shirt, khakis and a yellow pocket square — is imbued with Bumble’s modern architecture-meets-honeybee aesthetic. The bee motif carries all the way through the honeycomb bookshelves; a honeycomb mirror arrangement; and faux, honeycomb tile in the bathroom. Everything else is some variation of yellow or gold — the lighting fixtures, the stools, the walls, the couches, the chairs and the throw pillows. Hive is intended as part brand experience, part co-working space. Anyone with a Bumble profile can avail themselves of the plush couches, Wi-Fi and free boxed water. But today — Valentine’s Day — it’s also functioning as a dating consultancy, with Bumble employees offering 1-on-1 profile consultations to any members who want one. Valentine’s Day is either the ideal or most depressing day of the year to be fine-tuning your Bumble profile. I’m not really sure. All I know is earlier today Bumble sent me an email saying it’d help me curate the ideal dating profile, one sure to generate me more matches, and I’d be remiss to not take advantage. I settle into one of the taxi yellow banquettes along the wall, and after Alex Williamson el-Effendi, Bumble’s head of brand and one of the founding members of the popular dating app, finishes her appointment with the ponytailed gentleman before me, she beckons me over. In a black turtleneck and beige pencil skirt, she personifies Bumble’s refined but approachable brand image. I hand her my iPhone (always an anxiety-inducing experience), and we begin the excruciating experience of having someone evaluate my dating profile. That’s why you see so many people essentially give up and put “lol I’m not good at writing dating bios” where their witty personal statement should be. It’s a defense mechanism against putting your true self out there — and having someone swipe left on it. “Are you an actor?” she asks me. This is Williamson el-Effendi’s kind, disarming way of saying my photos are too sterile. Ever since I was a kid, I’ve had a deep insecurity about having my photo taken. It’s my contention that I don’t photograph well. In response, my profile is filled with a series of well-manicured selfies — ones that took me half an hour to take, and that I then improved with Snapchat filters. Another photo is a professional headshot I had taken several years ago, which, in L.A., gives off the impression I’m an aspiring (read: struggling) actor. This is the wrong tack, Williamson el-Effendi tells me, and she starts scrolling through my Instagram profile, looking for photos that better reflect my personality. “I’m seeing your personality so much more,” she says. To my utter shock, she starts picking out candid photos of me being drunk and goofy with my dumbass guy friends — a group selfie of us at the Kentucky Derby (a photo in which I’m wearing a fedora), and another of me and my frenemy wearing matching outfits in New Orleans. “But are you goofy?” she asks me. My photo insecurity is common, she assures me. “Everyone tends to view themselves in a harsher light.” Every man should have a friend, preferably a female friend, choose their dating profile photos for them, she recommends. After she finishes uploading and re-ordering my new photos — she leaves in one of my original photos, one of about four candid shots in my life that I actually like — she moves on to the written portion of the examination. Nerdy lumberjack seeks independent woman to cook for. 6’2” and know the proper way to use a semicolon. I wish I could take full credit for this, but I perfected this punchy, two-sentence opener months ago with the help of a panel of women.